Adho Mukha Svanasana is an incredibly versatile asana. Not only is it an important pose in its own right, it can be used throughout a sequence to link poses or as a preparatory pose. Adho means down, Mukha is face and Svana is dog. The name Adho Mukha Svanasana arises from the pose’s similarity to a dog stretching to wake itself up after a nap. We generally do downward facing dog before inversions because the pose helps prepare the shoulders and arms. As a semi - inversion, the pose also prepares the mind and nervous system for full inversions like Adho Mukha Vrksasana (handstand), Pinca Mayurasana (forearm balance) and Salamba Sirsasana (headstand). Downward facing dog pose provides some of the benefits of a full inversion. Because the head is lower than the heart the brain is flushed with fresh oxygenated blood, reducing mental fatigue. Adho Mukha Svanasana also releases the neck after Sirsasana and acts as a transitional pose before standing. As Adho Mukha Svanasana opens the chest, arms and shoulders as well as stretching the back of the thighs, knees and calves it can be used to move into backbends or forward bends. Proceeding backbends it opens the chest and arms especially important in Urdhva Dhanurasana (upward facing bow pose) . After backbends it helps to release the spine and stretch the back and the legs. With the head supported downward facing dog pose quietens the nervous system and is often incorporated into restorative and pranayama classes. The heart is rested making it a useful pose for those suffering from high blood pressure or fatigue, especially if done with the support of ropes around the upper thighs. the floor to measure the correct distance and then lifting the hips up and straightening the legs. Once in the pose, we consolidate our actions and observe the symmetry and alignment of the pose. All asana require us to balance action with reflection if we are to master them. Our starting point is the foundation of the pose. In downward facing dog pose that is the feet and the hands. Distribute the weight evenly across the hands, especially engaging the index finger. Pressing the base of the fingers down helps to lift the elbows and thus create space in the upper elbow. This action also helps flexible students who tend to sag between the shoulders. The weight in the feet is distributed evenly across the ball and the toes. And as in Tadasana, both sides of the body bear equal weight. Alignment allows the energy to flow evenly creating lightness, spaciousness and ease. Awareness then moves from the external body to the inner organic body and the mind is focused and quiet. A common mistake is to push the head to the floor causing the knees and elbows to bend and placing excessive pressure on these joints and the shoulder girdle. Generally when students push the head to the floor, they lose the proper action in the legs causing the hips and thighs to move towards the arms, compacting the shoulders, elbows and wrists making it more difficult to stay in the pose for an extended period of time. This is often associated with a sense of fullness or congestion in the face. To counter this, press the head of the thigh bones back and lift the inner thighs. This creates extension through the side waist, ribs and spine. And while good alignment initially may seem to be about an external action, ultimately it should bring a sense of lightness, ease and space as well as focus in the pose. Q. What are the common challenges students have with this asana? A. It depends on the level of the class, in a beginner’s class, its is understanding the pose and what you need to do. So it’s more a sense of knowing where you are in the pose – becoming familiar with the pose – orientating yourself; knowing the right distance between the feet and hands, where to press through and where to extend. Beginner students often have tight hamstrings and shoulders and need to develop stamina to hold the pose without creating tension. So it’s better to repeat the pose a number of times so as not to become exhausted. Q. What is the best way to work with this pose when you have tight hamstrings? moving away from the pose. When you have tight hamstrings you’ll notice more rounding in the back and a dropping in the chest so raising the arms on a support such as a chair would help. Q. For someone with tight hamstrings are there other ways to access the hamstrings? A. Working through the legs, lifting the kneecaps up and pressing the head of the thigh bones back does work the hamstrings. Sometimes you have to use other poses to access and bring more awareness to the back of the legs such as Utthita Trikonasana, Parsvottansana, Prasarita Padottanasana and Utthitta Padangusthasana. With dog pose there is a lot of work in the arms and some people find it harder to access the legs especially if the hamstrings are tight and they have a soft lower back – all the work goes there so you end up with a rounded back. Raising the hands up on to blocks or a chair can help or lifting more through the shoulders. It is important not to push so deeply through the shoulders but rather working through the legs first helps the student become aware of the action needed in the legs. Working with a block between the thighs engages the inner thighs and can help you access the hamstrings and release the back of the sacrum area. Q. What about dealing with tight shoulders resulting in rounding of the upper back? A. You need to lift more through the armpit area. Hold the pose for shorter times and work on other poses to open the shoulders. Q. What do you suggest for people with arthritis in the fingers who can’t press their fingers to the floor? A. If it’s painful use support such as legs in ropes to build confidence and learn to extend and press the fingers to the floor. Q. What is the primary purpose of the pose? A. I will do the pose with a purpose in mind depending on what I might be doing next. So it depends on the sequence I’m doing. I might do dog pose for inversions, or as a preparation before backbends or as a release after backbends. 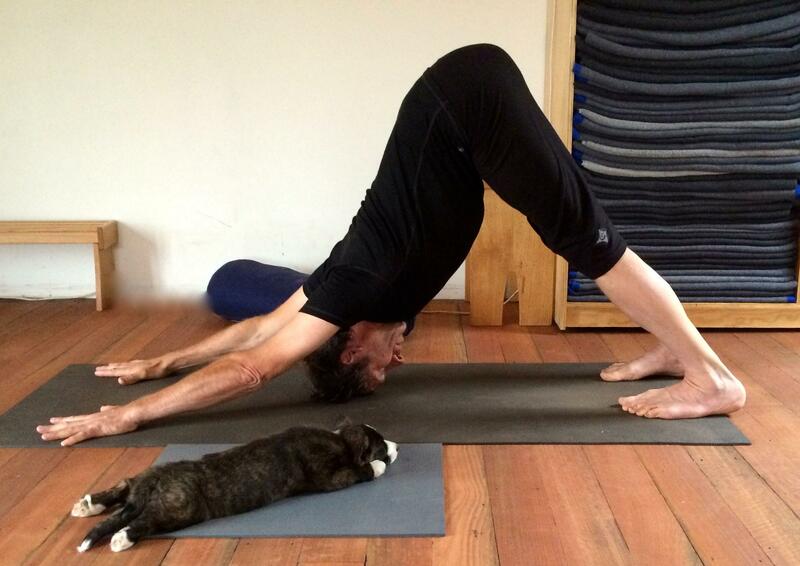 But the purpose of dog pose or any pose is to quieten and focus the mind. In a variety of poses there are many different challenges and to keep the mind centered in all those poses creates a stronger base for the mind to be quiet, not just in the sitting pose. Yoga is achieved by stilling the fluctuations of the mind so ultimately that is the purpose of every pose. When our awareness is spread through the whole body without wavering from one part to another that is meditation in action. Downward facing dog and spatchcocked dog!